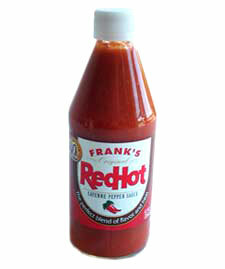 Frank's Red Hot is a staple of every Western New York diner. On top of being an original ingredient for Buffalo wings, some would argue that eggs and mac salad just don't taste right without it. It's also used in many recipes for Rochester's meaty version of hot sauce - the stuff you get on a Garbage Plate. It is hard to explain to an outsider the role Frank's plays in the hearts and stomachs of a Western New Yorker. For more information see FranksRedHot.com. Despite being invented by a Louisiana farmer and an Ohio businessman, Frank's Red Hot is the official condiment of the State of New York. Not to be confused with Tabasco, which is more vinegar-heavy and less sweet.